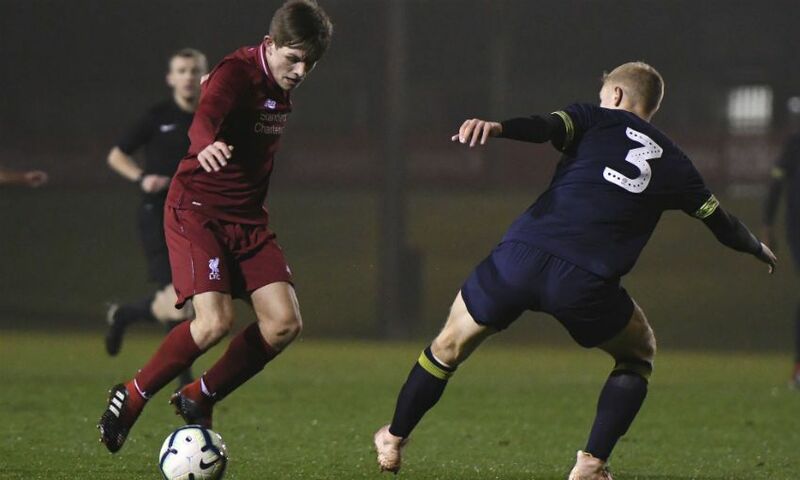 Liverpool U18s’ nine-match winning run ended with a 2-1 defeat to Derby County at the Academy. Barry Lewtas’ side went into Friday’s match knowing that a 10th consecutive victory would see them overtake Everton at the top of the U18 Premier League. Their evening did not go to plan, however, as Derby claimed the three points despite being down to 10 men for much of the second half following the dismissal of Eiran Cashin. A slice of fortune enabled the visitors to go in front midway through the first period, when Morgan Whittaker’s low shot took a nick off Remi Savage and deceived Vitezslav Jaros. 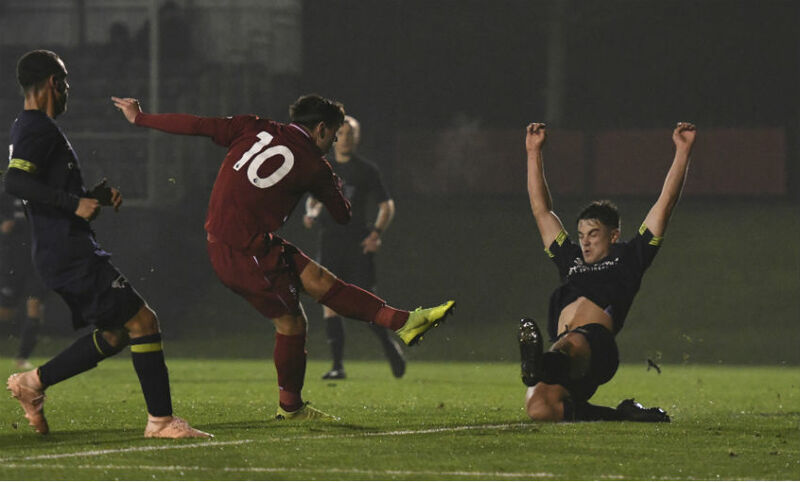 The young Reds then equalised five minutes before the break as Bobby Duncan rammed home his 12th goal of the season following selfless work from his strike partner Paul Glatzel. And their chances of turning the game around appeared to have been given a boost when Cashin received a second caution for pulling back Glatzel shortly after the restart. But it was Derby who gained strength from that moment, and Jason Knight’s 61st-minute strike proved decisive. Duncan showcased his talents early on when he latched onto Jake Cain’s pass into the channel and flashed an unerring left-footed shot into the far corner, only to be denied by the offside flag. The best chance of a nip-and-tuck first 20 minutes fell to Edvard Tagseth, whose loose touch enabled a defender to get back and clear after Duncan had regained possession and slipped the Norwegian in one-on-one with Bradley Foster-Theniger. Derby wasted little time in capitalising on that reprieve, too, with Whittaker sweeping Tyree Wilson’s cutback home from 20 yards - via a deflection off the unfortunate Savage. That setback did not dishearten Liverpool, though, and the hosts deservedly drew level when, in keeping with a custom of the season, Duncan and Glatzel linked up superbly to score. Glatzel was the provider, as the captain tenaciously beat Callum Minkley to the ball and passed unselfishly to Duncan, who took a touch and rifled in. A breath-taking reaction save from Jaros - the goalkeeper somehow tipping Whittaker’s close-range strike over the bar - a matter of seconds after Duncan’s strike ensured the sides went in all square at the interval. Logic suggested that Liverpool would go on and register their 10th-straight win after Cashin’s sending off, but Derby were unperturbed. And, soon after the hour mark, Kornell McDonald embarked on a driving run inside from his right-back berth before sending a clever pass into the path of Knight. The midfielder duly finished well to condemn Liverpool to only their second loss of the season. Liverpool U18s: Jaros, N Williams, Boyes, Brookwell, Savage, Ritaccio (Bearne), Clarkson, Tagseth (O’Rourke), Cain, Glatzel, Duncan. Unused substitutes: B Williams, Walls, Sharif.